I hope everyone is having a happy Monday. I had fun trying to drag myself out of bed this morning, slept 15 minutes past my alarm and had a nice rush to get out the door. Guess my body needed the extra sleep, though I’m pretty sure my boss wouldn’t be happy with that excuse. We watched Life on the Discovery Channel last night and while it was an amazingly beautiful experience in HD, I was sorry I watched the part where a komodo dragon pack takes down water buffaloes, so sad and graphic. Yeah, I know carnivores in the wild are very brutal when it comes to hunting and eating prey, it was still a painful thing to watch. But, it made me grateful that I have a choice to not eat like that and can live much healthier and satisfied without brutally sacrificing other lives, that I’m a complex being with many food choices available. Anyway, before going raw, I avoided dry cakes like the plague in the name of eating healthy and saving dessert splurges for something more worthy. I have never been a fan of dry sheet cake with over-sugary icing and much more so now knowing of the crazy processed ingredients in most box mixes. I hide at my desk and quietly hold down the fort while the rest of the department heads down to the cafeteria for the company’s monthly cake day. The last time I gagged a piece of dry cake down was while visiting family months ago, so much effort was put into making a “simple” boxed cake by adding chocolate chips for moisture. It was a Betty Crocker box mix that was mixed in a saucepan with chocolate chips before baking to add chocolate and moistness. For a simple cake, it was a lot of work. 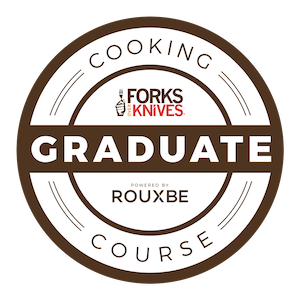 First, the chocolate chips had to be melted on the stovetop, the cake mix prepared then blended with the melted chocolate, then the mixture poured into a baking dish and baked for x amount of time, then cooled. A time consuming process requiring a lot of babysitting. I ate a piece, not my proudest moment and I regretted it because the cake was too dry. If those chocolate chips were supposed to add moisture, they weren’t doing their job! On top of that, the chocolate flavor was a serious disappointment. But it was a good experience, an important reminder of why I avoid cheap, processed cake. And thankfully I’ve become much stronger with my diet being able to put my foot down to such guiltily pressured temptations in the future. That cake was not worth the effort and by no means “simple” compared to some of the raw recipes I’ve been able to throw together with better ingredients in minutes and have enjoyed so much more. 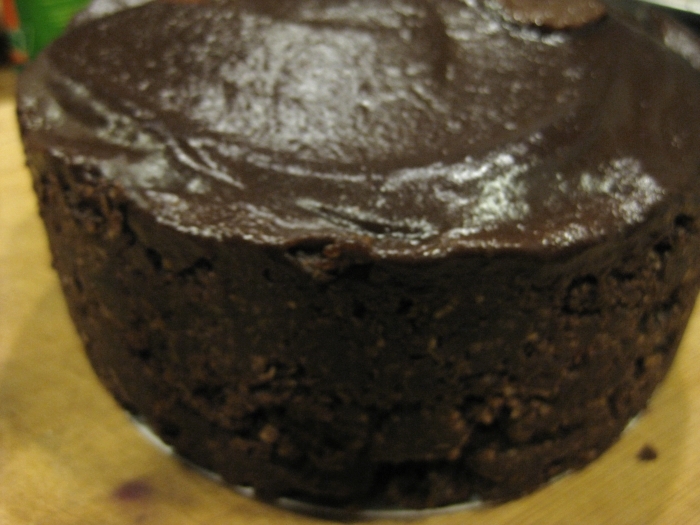 However, I am a sucker for a good, rich, dark, flour-less chocolate cake and might be known to splurge on a piece on a nice night out for special occasions. 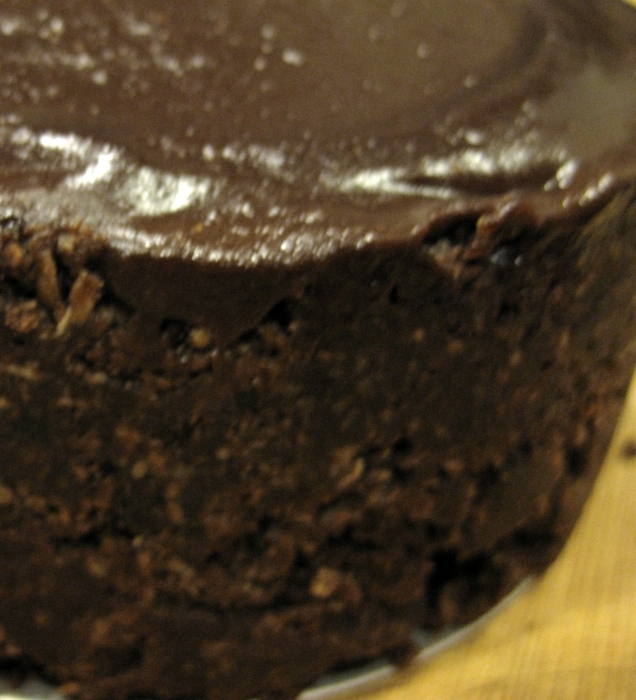 One that is so moist, it has a cheesecake-like texture with an intense chocolate flavor not marred by over-sweetness. And moisture that is so consistent, it really does not need icing … though wouldn’t hurt with it. I’ve gotten pretty close sampling and trying many raw cake recipes, but the cost of the ingredients of some have kept me from making them too much and one of my favorites contains a lot of Brazil nuts which can be too good a source of selenium if not consumed in moderation. 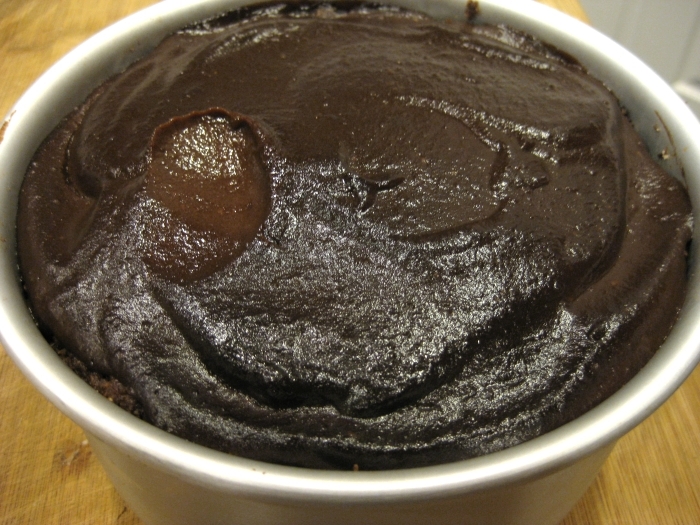 Place almond pulp, carob powder and coconut in a food processor and blend. While mixing, add the dates and continue blending until a thick dough texture is reached. It’s best for the dates to be room temperature so they’re softer an easier to remove the pits. Still, pureeing and mixing un-soaked dates can be a challenge for some food processors, you might want to pre-soak the dates if you think it’ll be a problem. Pack mixture tightly into a 6″ or 8″ cake pan with a removable bottom (I have this one), depending hall tall/wide you’d like the slices. A square glass baking dish would also work for square pieces. Blend ingredients in a blender until smooth, thick texture is reached. Pour on top of cake and spread evenly. 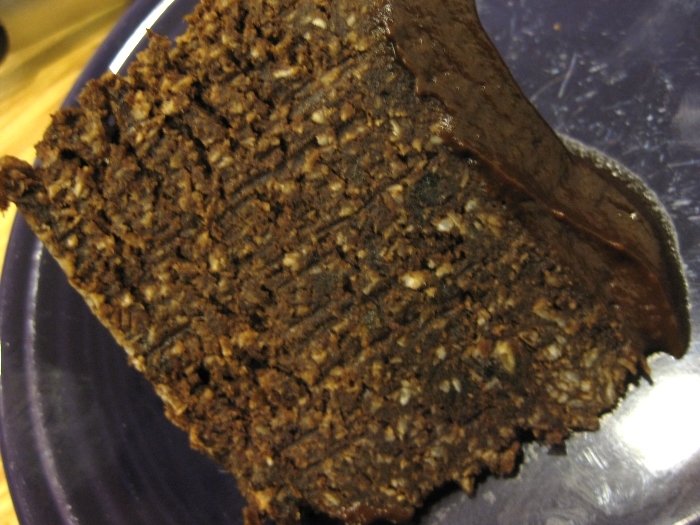 Chill cake in fridge for 30 minutes before serving and enjoy! 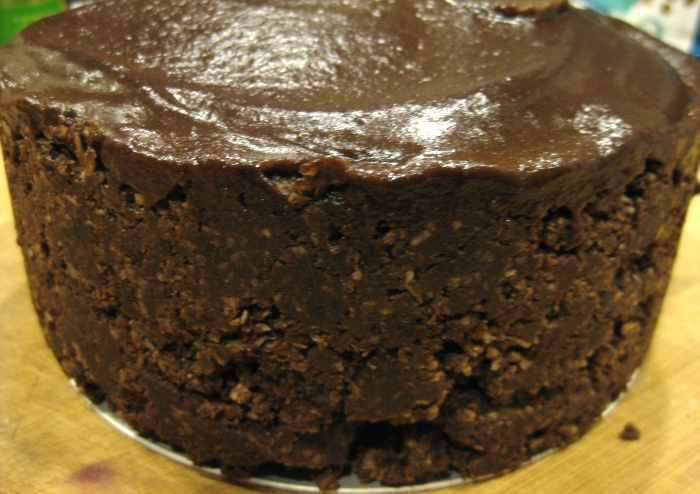 The texture is like a super-indulgent flour-less chocolate cake and the sweetness of the dates and coconut is evenly spread through the cake with an amazingly strong chocolate flavor that should impress any non-vegan chocolate nut. 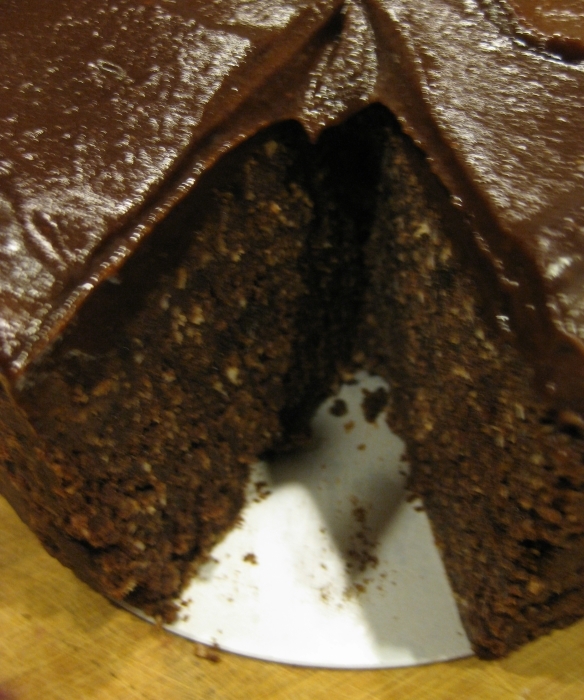 The cake is very dense and thick, a bit of a challenge to cut through, but holds together nicely, not crumbly like other raw cakes I’ve tried. I’m thrilled that this is a great way to use up my almond milk pulp to create a great, healthy dessert and the whole cake took less than 20 minutes to assemble. 3 cups of almond pulp is from three 4-cup batches of almond milk and something I produce in about 2 weeks at the rate I go through homemade almond milk. Also it’s the max amount I can fit into a sandwich-sized freezer bag and makes an easy amount to use at a time. To defrost, I place in a bowl and warm in the dehydrator for about 2 hours at 115 degrees, it works great to dry the frost moisture as it warms. So here you go, use your almond pulp for your next chocolate fix or to throw together a quick, healthy cake for a last minute party, potluck or just to gift a friend with something sweet. Hi Jaclyn, sunflower seeds should work fine in place of the almond pulp too. I am planning on making my own almond milk and this is a wonderful recipe to start using my pulp – so chocolaty and dense! Thank you so much for sharing! This sounds fantastic! Nothing’s worse than dry and overly sweet cakes. ok i think i am drooling…..yum. gonna have to give this one a shot :) thank you for posting it. i was running late today too! Girl im serious you need to create a raw cookbook!!!! Awwwww yeah Anthony had the gangsta domo shirt, lol!! !